Cocker Spaniel Information: The Hard Facts! Looking for reliable Cocker Spaniel Information? Discover all you need to know about this adorable breed including info about their wonderful temperament, characteristics and health concerns! 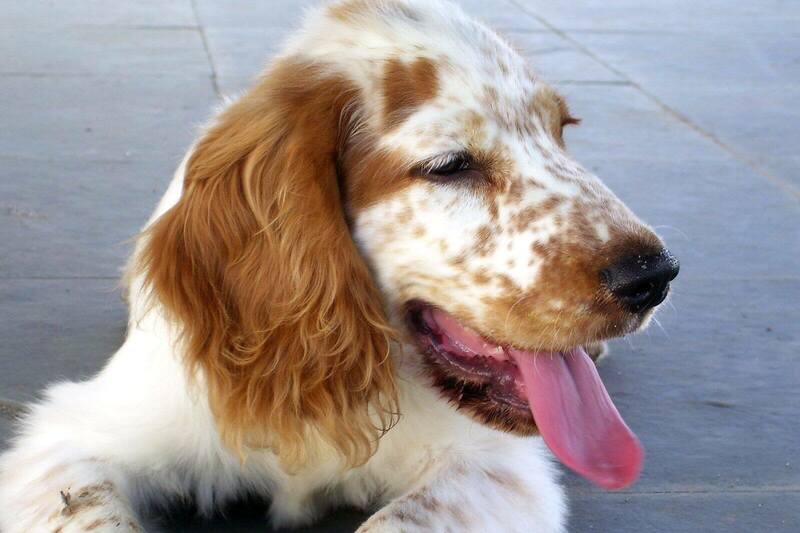 As the name suggests, Cocker Spaniels originated from Spain and have been with us for many years, either as willing gun-dogs, faithful companions, or as loving family pets. These sturdy little gun dogs were given the name 'Cocker' because of the woodcock they were bred to catch. They have a good nose and it’s this great sense of smell that allows Cockers to flush birds from hedgerows and fields so that the hunters (following behind the dogs), could shoot the birds as they emerged. The Spaniels, who were trained to retrieve the birds using a ‘soft mouth’, would then trot off merrily to retrieve the game. If you'd like to learn more about the history of Cockers just follow the link. Cocker Spaniels are very gentle and loving dogs, and once you've owned one, I guarantee you won't want to own any other breed of dog, ever! They're very affectionate and playful and although they can be reserved with strangers, once they get to know you they’re very friendly and extremely loyal. They love to bark to let you know that there’s someone coming up the garden path, or there's someone at the door, but if you’re looking for a burglar alarm, forget it, a Cocker is more likely to lick an intruder into submission! However, Cocker Spaniels can sometimes be timid which is why it’s especially important to make sure your puppy gets lots of socialisation as early as possible and that you continue to socialise him well past his first year to help him become a happy, confident dog...without behavioural problems! They can also be a little stubborn too, but they're inquisitive and intelligent, and so willing to please - all of which make them very easy to train. They're exceptional hounds, equally happy as working gun-dogs, as affectionate companions, and as they're especially good with children of all ages, they make good family pets. I may be biased, but the Cocker Spaniel temperament is definitely a winner for me! As you can see from this photo, Cockers are very handsome dogs, with their luxuriously glossy, silky coat and typically long, floppy ears - aren't they just adorable? Their tails, docked or otherwise, are constantly wagging. In fact, Cockers often wag their tails so enthusiastically that their bottoms wiggle from side to side too! You’ve heard the saying, ‘the tail wagging the dog’.....well, I’m just saying! ...And when they look up at you with those beautiful soulful eyes, who could possibly resist them? Cocker Spaniel characteristics are so very appealing, but one word of caution, they can sometimes be a little greedy and will eat almost anything on offer - mine certainly does. Only last week, he (accidentally?) munched his way through an entire box of doggie bones! Cockers are also prone to pupping on weight as they grow older so it's advisable to manage their diet carefully. Most dog breeds have health problems that are specific to their breed and the Cocker is no exception. Please don’t think that your pet is going to get all of the above, it’s not true. These are simply some of the health problems that he could develop at some point in his lifetime. If you own, or are planning to own this wonderful breed, I think it's helpful to understand what problems may arise, and you can learn more about Cocker health concerns here. Cocker Spaniels have medium to long coats which may be straight or wavy and feel very silky to the touch. They have feathers on their legs, chest, and underbelly. Their coats come in beautiful solid colours such as, golden, red, chocolate (liver), or black, black and tan, liver and tan, and parti-colours for example, orange and white, liver and white, lemon and white, and black and white. Then there’s the tri-colours, black, white and tan; and liver, white and tan. Roan markings are probably one of my favourites, especially the blue roan. Other colours include, orange roan, liver roan, lemon roan, blue roan and tan, liver roan and tan. You may see some patterns and markings, and sometimes there's a little white on the chest and throat, or tan markings, for example, on the eyebrows, throat or feet. Although they're not renowned for shedding, some Cockers do. Thankfully, mine doesn't shed too much, it's manageable, but Max does need to be brushed at least once a week to keep shedding to a minimum. Your Cocker's coat will need to be brushed every day if he's allowed to romp in fields and the undergrowth, but if he's walked in the local park or around town, you’ll probably get away with brushing him once a week. His ears however, will probably need to be brushed twice or more each week to keep them silky and tat-free. Extra care should be taken to brush under the ears and around the openings as that's where they tend to mat the most. I keep the hair around the entrance to the ear canal trimmed very short to allow air to circulate and because bacteria thrives in warm damp places, this helps to keep bacteria in check. His ears will need to be cleaned once a week to ensure bacteria is kept to a minimum and infection is avoided. You can bathe your Cocker once a month or every three months, depending on what he gets up to and so long as he doesn't roll in anything nasty. I usually give Max the sniff test – if he smells bad, I bathe him. If he just smells of warm ‘doggie’ I’m happy to leave him for a little while longer. Their eyes needs to be cleaned regularly too. I check Max’s eyes most days and if there’s any ‘gunk’ in the corners, I remove it with a damp soft tissue to prevent irritation or infection. Always remember to use a separate tissue for each eye to prevent cross infection. There are other 'routine checks' that I recommend you add into your Spaniel's grooming sessions, such as; cleaning his ears, clipping his nails and checking his teeth. If you'd like a more detailed explanation of how to groom your Cocker Spaniel, just follow the link. Cockers are energetic dogs and love nothing more than a long brisk walk or a run in the park. Keep your pet well-exercised and you’ll have a calm, contented dog. An hour each day should be enough, but if you’re prepared to do more, go for it! 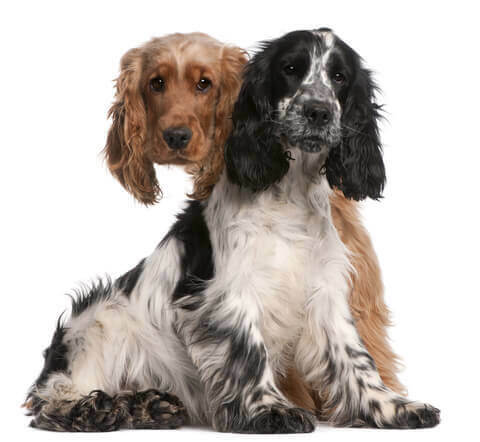 There are many other Spaniel breeds to learn about, including the American Cocker, the Clumber Spaniel, the Irish Water Spaniel, the Field Cocker, and so on. Some are some more pleasing on the eye than others, and some more suited to a certain terrain, and a few make better hunting dogs than household pets. 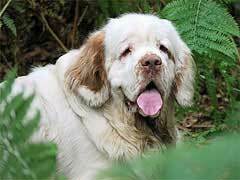 The photo to the right shows a Clumber Spaniel. It's quite a 'chunky' dog and often has a very 'sorrowful' look. It's the heaviest of the breeds, but I have to say, I think they look wonderful! We had a Clumber living near us when we lived in the UK (his name was Rocks!) - he was such a lovely looking, good-natured dog - he was such a character too! Although some of these breeds look very different from what we've come to love as the more 'typical' Spaniel, all have a very special place in my heart. Follow the link for a brief description and photograph of a range of Spaniel breeds. I hope the information about the Cocker Spaniel outlined on this page has given you a better understanding of this wonderful breed and that you're feeling a little more confident now. They truly are a delightful breed, and so long as they're trained and socialised well, they will fit into any family home, especially a home with children. There's lots to understand about buying a puppy, and this article is packed full of helpful tips about what to look out for before you part with your cash. And did you know that if you've never owned a dog before, it's best to choose a less dominant puppy? Plump for a slightly subservient pup and you'll have a much easier time all round. Who knew that picking a puppy could be so involved? Once you know what to look for in a puppy, you may then like to know how to find a good breeder, but how will you know that you've found a reliable breeder and not one who's just in it for the money? 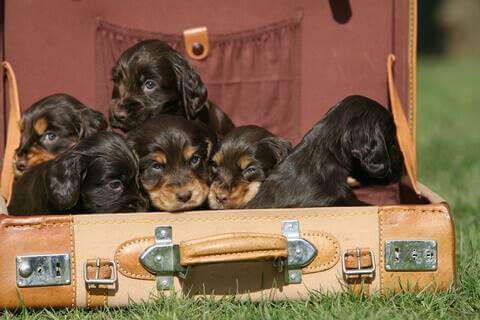 Our directory of Cocker Spaniel breeders will help you find a breeder local to you, give you tips and ideas on what to look for in a breeder and what questions to ask. Well, it’s over to you now - I wish you lots of luck and success in finding your perfect puppy!